We’re heading into day 3 prelims of the TYR Pro Swim Series stop in Atlanta, where swimmers are set to compete for finals spots in the 200 fly, 100 breast, 100 back, 200 IM, and 400 free. Several stars headline today’s session, including Jack Conger (200 fly), Ryan Murphy (100 back), Ryosuke Irie (100 back), Chase Kalisz (200 fly/200 IM), Kevin Cordes (100 breast), Zane Grothe (400 free), Clark Smith (400 free), Will Licon (200 IM), and Josh Prenot (200 IM) on the men’s side. The women’s events feature Hali Flickinger (200 fly), Kelsi Dahlia Worrell (200 fly), Molly Hannis (100 breast), Olivia Smoliga (100 back), Taylor Ruck (100 back), Wang Jianjiahe (400 free), Melanie Margalis (200 IM), and Madisyn Cox (200 IM). 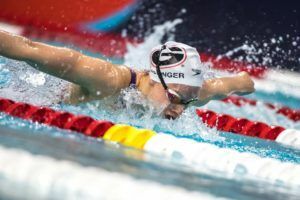 Hali Flickinger was the only swimmer to break 2:10 this morning, turning in 1:02.49 en route to her 2:09.47. That makes her the 7th fastest swimmer in the world this year. In finals, she’ll be up against Hungarian Liliana Szilagy, who is currently ranked #5 in the world with a 2:08.48 from January. Kelsi Worrell had the fastest front-end speed this morning with a 1:02.40 and held on for 2nd seed heading into finals. Jack Conger swam to #3 in the world this year with his 1:57.60. After his best time in the 100 fly earlier in the meet, he could potentially have a big swim in store for tonight. Chase Kalisz cruised to 2nd seed ahead of teammate Pace Clark. 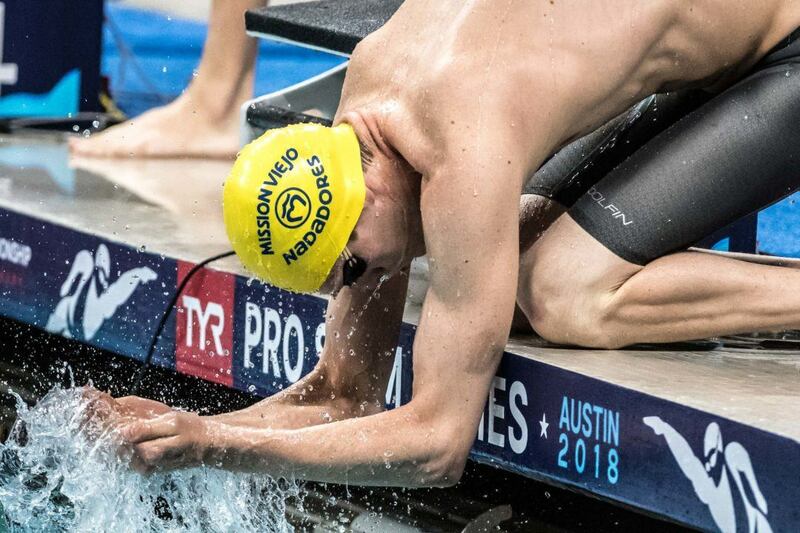 Kalisz is currently the fastest man in the world this year with his 1:55.63 from the Austin Pro Swim. 15-year-old Dare Rose knocked over half a second from his time to join them in the final. The championship heat will also feature Olympic butterflier Tom Shields. Molly Hannis was within a few tenths of her best to take the top seed by a second over Russian Olympic medalist Yuliya Efimova. Hannis is now the fastest 100 breaststroker in the world this year, topping Katie Meili’s 1:06.49 from the Austin Pro Swim. There will be several Olympic breaststrokers in this final tonight, as Breeja Larson, China’s Shi Jinglin, and Jamaica’s Alia Atkinson will also be in the mix after qualifying for finals with 1:08s. Andrew Wilson knocked a few tenths off his lifetime best as he demolished the Pool Record by over a second. He took it out in 27.75 and split a 31.44 coming home. Wilson overtook Adam Peaty (59.62) as the fastest man in the world this year, but Peaty put up a 58.78 in Edinburgh today to reclaim that position. He’ll be joined in the final by Olympic medalists Josh Prenot, Cody Miller, and Kevin Cordes. 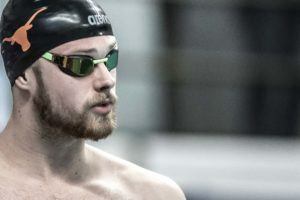 Last season’s NCAA champ Will Licon and World Championships breaststroker Nic Fink will also be in the mix, as will Brazilian Worlds medalist Felipe Lima. Singaporean Lionel Khoo (1:01.61) and Sweden’s Erik Persson (1:01.67) narrowly missed out on the final. Olivia Smoliga notched the top spot by hundredths over Taylor Ruck. In tonight’s final, Ruck will be seeking a backstroke sweep. She’s been having a great meet so far, breaking the Canadian Record in the 200 free last night and posting a best time in the 200 back. 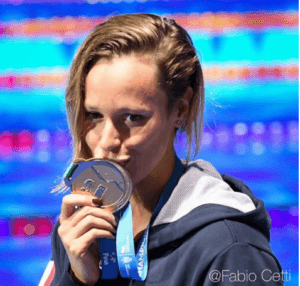 Federica Pellegrini will look for another backstroke medal tonight after finishing as the runner-up to Ruck in the 200 back. Also in the mix is Pool Record holder Ali DeLoof, who qualified 7th. Japanese backstroke star Ryosuke Irie was the only man to break 55 this morning, flipping in 26.15 en route to a 54.33. Teammates Jacob Pebley and Ryan Murphy will battle again tonight after their close race in the 200 back last night. Pebley once again negative split his prelims race. He flipped in 27.77 through the front half, but brought it home 3 tenths faster in 27.44. Taylor Ruck set herself up for another finals double. The Canadian junior led the way with Ruck taking top seed and Kayla Sanchez finishing a few tenths back. They’ll also have Rebecca Smith among the talented Canadian juniors in the final. Last night’s 400 IM champ, Madisyn Cox, has been having a great meet. She set herself up to challenge for another title as the 3rd seed and will go for the IM sweep. The majority of swimmers in the top 8 qualified on the back end of a double. Chase Kalisz, who qualified for the 200 fly final, cruised to the top spot this morning. Michael Andrew and Josh Prenot, who qualified for the 100 breast final, rounded out the top 3 this morning. 2017 NCAA champ Will Licon is also slated to swim in the final of both events with Andrew and Prenot. Mack Darragh will join Kalisz in this race and the 200 fly. 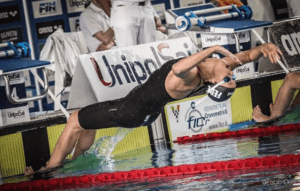 Wang Jianjiahe set herself up to challenge for a distance sweep. Tonight, she’ll be up against U.S. National Teamers Ashley Twichell, Hali Flickinger, Erica Sullivan, and Haley Anderson. This is the 2nd final Flickinger has qualified for, as she also qualified as top seed in the 200 fly. 17-year-old Kaitlynn Sims of Magnolia Aquatic Club knocked over a half a second off her lifetime best to qualify 7th. The top 3 were separated by just over a tenth, with Marwan El Kamash leading the way to slightly edge 800 free champ Zane Grothe for the top spot. 16-year-old Jake Magahey of SwimAtlanta broke 4:00 for the first time, knocking over 3 seconds off his best to qualify 6th. 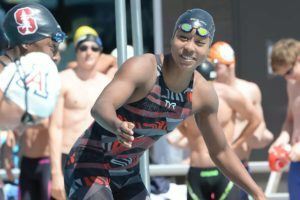 Scarlet Aquatics’ 15-year-old Dare Rose went another best time, shaving over half a second off his time to qualify for his 2nd championship final of the day. Olympic freestylers Clark Smith and Matias Koski were no shows this morning. Really? You really think that comment was worth making? I thought it was a fair observation. MA had the second fastest 1st 50 of the finalists and the slowest 2nd 50. They have put his training method out for the world to see. Observations/criticisms of it are to be expected. I think that’s a fair point. 1 is not really a fair sample size to judge a method though. Are there any others that explicitly use it? I’ve heard a few people talk about using it explicitly but a lot of former swimmers and masters swimmers and a few others here and there. Heard some dad’s saying their coaching their age group kids. None having enough success or the courage to really put it out there except Josh Davis a few years back and if I recall he had success with it. Also I think Mel but idk if he’s been doing meets. I think a more salient point is that they have touted this method as THE only method to achieve success. They have used “science” to advocate that everybody else is doing it wrong. That is why the criticism is to be expected, regardless of how widely USRPT is used. (Notice I don’t say that the criticism was fair, just that the observation was fair).